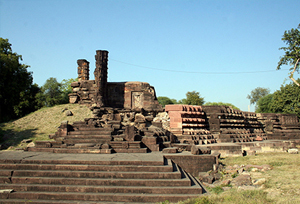 Vidisha is a historical town with ancient buildings that dates back to the 2nd century, near the capital city Bhopal. This tiny city is known for its rich cultural heritage and historical monuments that reflects the great artwork of the Gupta Empire, who ruled the region for a very long time. The magnificent past of Vidisha, makes it one of the most popular tourist destinations in Madhya Pradesh, visited by a large number of tourists, especially historians and art lovers. This place lies at the meeting point of the Betwa and Beas River, which used to be the significant commercial center under the Sungas, Nagas, Satvahanas, and Gupta period. There are a couple of attractions in Vidisha that are worth visiting and Besnagar is one of them, which has the historical remains like Udayagiri Caves with inscriptions belonging to the Gupta Dynasty. 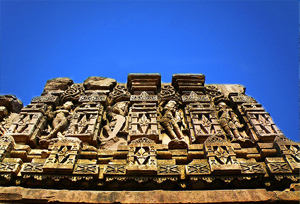 Vidisha also has ruins of the erstwhile shrine of Lord Vishnu and monolithic pillar, built in the 5th and 6th century BC. Similarly, there are several ruins here that are historical evidences of the trade centre, situated in Vidisha during the rule of King Ashoka, who believed to have ruled the city for a long time. A lot of things make Vidisha a special place, which almost every tourists love visiting. No wonder, the tourism in Vidisha is blooming, thanks to its important archaeological sites, ruins, inscriptions, and sculptures, that reflect the rich history of Gupta period. Vidisha town is divided into five areas i.e. the valley of Betwa, the Eastern Region, the Western Region, the Sindh Valley, and the Bina Valley. All these areas are dipped in magnificence of the splendid past of different dynasties, that ruled the region. If you have enough time to complete your ourney to Vidisha, you can plan your visit to Udaypur, known for the best Paramara architecture, and catch a glimpse of famous attractions such as Neelkantheswara temple, Sher Khan Masjid, etc. Apart from many deluxe, medium, and budget accommodation options, Vidisha has several luxury and standard hotels that provide all facilities to make your stay a memorable one. Some of the best hotels are listed below that can help you book the most comfortable and peaceful accommodation to stay luxurly. By Air: Raja Bhoj Airport in Bhopal is the nearest airport from Vidisha and is around one and half hours drive from here. The airport is connected to major cities like Ahmedabad, Chennai, Chandigarh, Delhi, Hyderabad, Indore, Kolkata, Mumbai, and Raipur. Tourists can take direct direct bus or cab from this airport to reach their desired location in Vidisha . By Rail: The nearest railway station is the Vidisha Railway Station, which lies in the center of the city and is connected to major cities like Nagpur, Kanpur, and Lucknow. Frequent buses, and taxis are available from this railway station to travel within the city. By Road: Road that connects Vidisha to other parts of the state are good and well-maintained. One can reach cities like Sanchi, Bhopal, Sagar, Hoshangabad, Dewas, Indore, Ujjain, Jhansi, Kota, and Nagpur through Madhya Pradesh State Road Transport Corporation (MPSRTC) and other private travel services. Best Time to Visit Unquestionably, winter is the best time to visit Vidisha, whose temperature remains pleasant and comfortable throughout the autumn and winter season. It is a perfect time to visit this historic city that attract visitors, mostly in the months between September and March.